The BJU Press Literature program is well done. Our daughters liked it because it correlates with the BJU Press Heritage Studies and has interesting literature selections. When given a choice of programs, they kept choosing BJU Press literature courses! These complete kits include the necessary components for one student and one teacher. With a proven track record—over 30 years experience in publishing textbooks—you can trust courses from Bob Jones University Press. Their literature courses are a favorite at Lamp Post Homeschool! 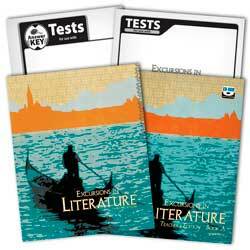 BJU Press Explorations in Literature Textbook Kit, 4th Ed. This literature course teaches a biblical perspective on six unit themes–courage, nature and man, generosity, our land, humility, and family. It strengthens students’ understanding of literature by focusing on advanced literary concepts. As with other teacher’s editions, the student text is printed in full color with Objectives, Lesson Support, Preparation, Teaching Strategies, Scriptural Application, and more in the margins. 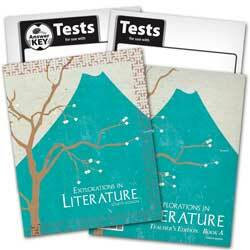 It includes a CD with teaching helps, bulletin-board ideas, writing rubrics, quizzes, ESL exercises, and much more! 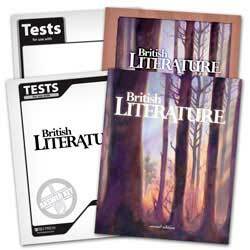 Teaches students to recognize and appreciate literary techniques, presents a variety of literary genres, and develops critical thinking skills. Non-reproducible for one student and contain questions and answers that are drawn directly from the textbook. Question types include multiple choice, short answer, matching, true/false, and brief essays. Midterm and final exam are included. 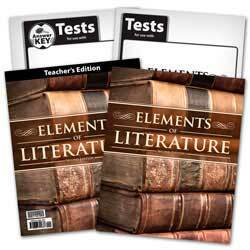 For easy grading, it has overprinted answers on copies of the student test pages.